JamUp Pro XT and AirTurn are claiming a worlds first this week with the unveiling of their new iOS Guitar/Bass Multi-FX System which is equipped with a with a wireless foot switch. The new iOS Guitar/Bass Multi-FX System has been announced ahead of NAMM the National Association of Music Merchants exhibition which starts tomorrow, where is will be showcased. Watch the video after the jump to see it in action. The new AirTurn BT-105 with two ATFS-2 Pedals and Pedal board retails for around $119.95 or a 4 pedal AirTurn BT-105 with ATFS-2 pedals retails for $159. The JamUp XT application is available to download for free at the iTunes App Store. “JamUp Pro XT users will be able to use AirTurn’s two or four pedal BT-105 Bluetooth controllers to switch between dozens of studio-grade amp and stomp box effects hands-free. 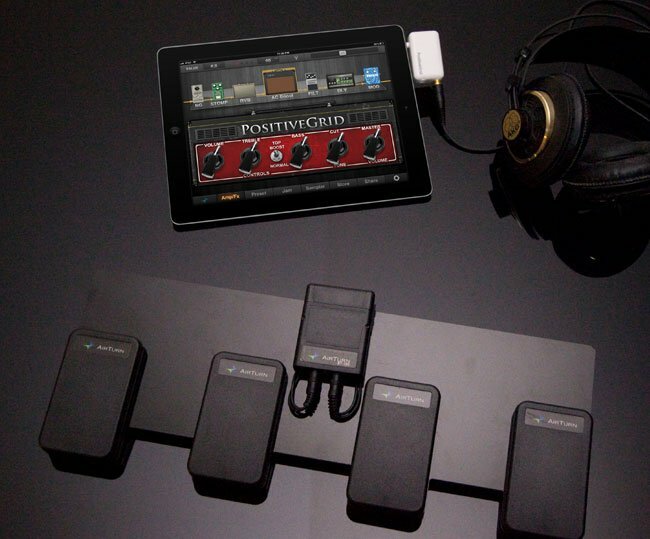 Each AirTurn pedal can be customized within JamUp Pro XT to perform various functions, from toggling amps and effect switches, to moving between presets, controlling Jam Player’s iTunes song playback functions, triggering various sampler recording and dubbing options, and even controlling the built-in metronome or tapping out the tempo, wireless and hands-free.